You'll find town home neighborhoods throughout the Charleston Metro area, but the majority of Charleston Real Estate town homes for sale are located in James Island, Mount Pleasant, Johns Island, West Ashley, Daniel Island and Summerville. Although many people use the terms condo and townhouse interchangeably, there is a major difference between town homes and condos. When you buy a town home, you own the land that your home sits on. However, when you purchase a condo, you only own the air space - not actual land. Another difference between condos and townhouses is that town homes often have small, private yards. Usually these yards are fenced in, so townhouses can be a great option for dog owners who want a small area outside for their dogs. 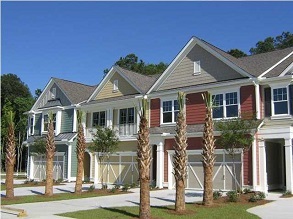 Town homes are great for buyers wanting a good location for less money compared to houses. They're also ideal for people who want less upkeep, since the exteriors and front yards of most townhouses are maintained through regime fees. To find your dream Charleston Townhouse, be sure to use our Charleston Real Estate MLS. Still not sure what you are looking for, or need some helpful tips on searching for the right home for you? Take a peek at our Charleston Real Estate Guide.